If you want to live in a really stunning and clean environment, you might want to get some help from the experts once in a while. The Denver Furniture Cleaning company is more than happy to come to your home or office to assess your upholstered furniture cleaning needs. 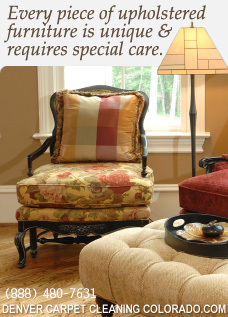 All our staff is trained and has the know-how to expertly care for all your furniture. Since today there are so many different types of fabrics and fibers used in furniture, it is practically impossible for the lay individual to be able to find out what precisely is used in their furniture. As a result, they cannot really know what products to use. And using a cleaning product that is specifically designed for your furniture is imperative. And that is exactly what Denver Furniture Cleaning will do for you. At Denver Furniture Cleaning we specialize in the cleaning and maintenance of all your furniture and if you want a regular cleaning or just a cleaning once in a while, we will be happy to oblige and we take the best care of all your furniture. Clearly there will not just be one product to care for all different types of furniture. These types range from: living room furniture, kitchen furniture, bedroom furniture, bunk beds, rocking chair, leather sofa, to cabinets, etc. That is why you just have to call the experts. And what better ones than reasonably priced, easy to work with, trained experts from Denver Furniture Cleaning? All our staff has been background checked and has plenty of experience working with individuals so no matter what your requests; they will be there to serve you with a smile on their faces. So what can you loose? Give Denver Carpet Cleaning a call today and we will be happy to come round to offer you a free estimate.